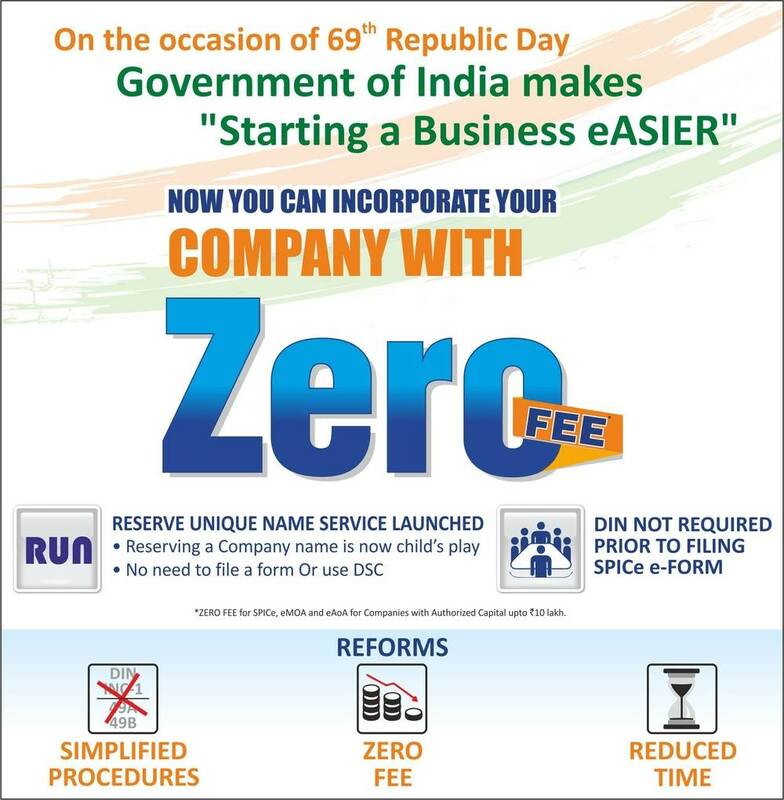 The Ministry of Corporate Affairs has taken another giant step towards making it easier to incorporate a Company and LLP in India by rolling out various process changes on the eve of the 69th Republic Day. In this article, we look at some of the major changes announced by the MCA pertaining to Company Registration and the process for incorporation of a company in India in the year 2018. Incorporation of a company can be done with prior name approval or using SPICe form, wherein incorporation certificate is provided if name is acceptable to the MCA. Entrepreneurs who wish to incorporate a company with a unique name can directly file for incorporation using SPICE form, saving time and money. On the other hand, if an Entrepreneur wants to incorporate a company with a name that could be similar to an existing company or LLP or trademark, then prior approval can be obtained from the MCA for use of name. Before the introduction of RUN web-form, application for reservation of name was to be made in Form INC-1 with upto 6 choices of name. Further, to apply for reservation of company name, a minimum of 2 Director Identification Number and 1 Digital Signature were required. 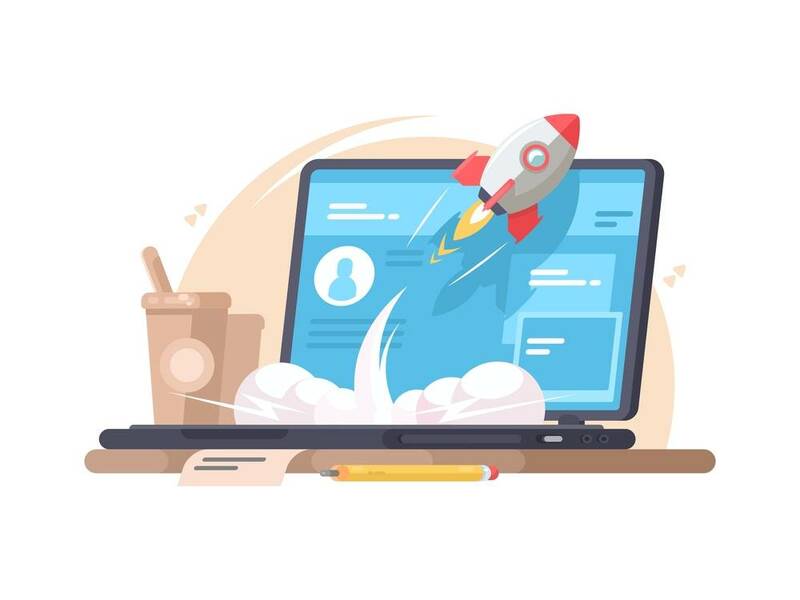 With the introduction of RUN web-form, a company name can be reserved quickly and easily even before obtaining a digital signature. However, only one name choice can be provided at a time. The fee for name reservation using RUN web-form is Rs.1000 per form submission – irrespective of whether the name is approved or not. To apply for name using RUN web-form, the Entrepreneur must first create a free MCA account. After logging into the MCA account, the Entrepreneur can choose the type of company to be registered and provide one name choice and check against the MCA database of company and LLP names. Its very important to note that the MCA RUN system only checks for identical LLP and Company names. However, Companies Incorporation Rules, 2014 states that a company or LLP cannot be registered with an identical or similar name to that of an existing company, LLP or trademark. Hence, the quick check system, even if it shows a name is available does not guarantee name approval. On submission of the RUN form with a Rs.1000 fee, the requested name would be checked by MCA personnel at the Central Registration Centre (CRC) against company, LLP and trademarks for tests of similarity. If the name is unique and conforms to the Companies Act 2013, name approval would be provided by the MCA and the applicant would be intimated through the email address mentioned on the MCA account. Click here to check company name availability. Any person who wishes to incorporate a new company can now apply for DIN only through the SPICE form. Hence, the details of Directors for whom DIN is to be allotted on incorporation must be filled into the SPICE form along with their PAN or Passport details. On incorporation of a company, DIN would be allotted for each of the Directors who did not have DIN. In case a person having DIN is incorporating a new company, SPICE form must still be used and DIN can be entered where ever applicable. From the 26th of January 2018, DIR-3 form can be used only by existing companies for adding a Director. The new DIR-3 form has provisions requesting the CIN of the Company to which the Director would be added and a declaration that the DIN is being obtained for adding the person as a Director to the company mentioned. Hence, care must be taken by Professionals to ensure that DIN is not wrongly obtained for a proposed Director of a new company. The MCA in an effort to simplify the company incorporation process and spur new Startups has announced zero fee for incorporation. Hence, Entrepreneurs would be able to save a few thousand rupees on incorporation fee. Though zero fees has been announced for the SPICE form, eMOA and eAOA – stamp duty would still be applicable for incorporation as before depending on the state of incorporation. 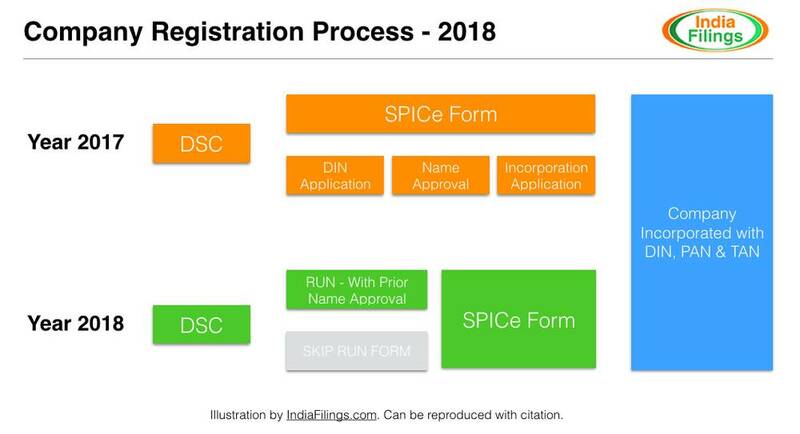 As illustrated above, the MCA has achieved significant process reduction by depreciating forms for name approval, DIN application and incorporation while improving ease of using SPICe form. A major drawback for using SPICe form used to be that Entrepreneurs or Professionals were unable to obtain prior name approval and were forced to redo incorporation documentation, in case of rejection of name while using SPICe Form. By introducing a web-based form for name approval called RUN, MCA has simplified the name approval process and has made it optional. Further, the fee for incorporation has also been done away with. Hence, in this new year 2018, more and more Entrepreneurs would choose to incorporate a company instead of a LLP or Proprietorship or Partnership firm, increasing the number of incorporations significantly.